Dr. Leonard Schultz, allergist and immunologist, lead the Saturday, March 9 Walk with a Doc. Stick to that resolution to get more active – just walk! That’s the message Pima County Medical Society (PCMS) is giving as a way to encourage Tucsonans to get out and move. And the physician organization plans to help you get started. PCMS has joined a national movement to get patients to walk a mile with a doc on scheduled Saturdays throughout the year. Each walk is led by a physician who gives a brief overview of the benefits of exercise and answers general health questions during the outing. “All of our missions involve improving public health,” said Bill Fearneyhough, former-PCMS Executive Director. 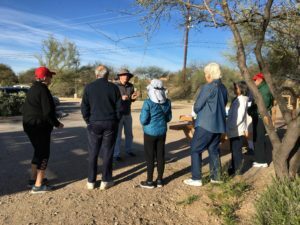 “We want Tucsonans to become more active and one way to do that is to show them they indeed can walk a mile,” he said. The walks are open to anyone and the course is generally flat. Wear comfortable shoes. You may bring a cane or walking stick, and a bottle of water. Be sure to dress for the temperatures. Please arrive at least 15 minutes prior to the walk start. Use the parking lot on the east side of Swan, just south of the wash. The group meets at the ramada by the water fountain. For questions or to schedule, e-mail Dennis Carey or call him at (520) 795-7985. Just Walk – Walk with a Doc is – a program founded in 2005 by David Sabgir MD, a board-certified cardiologist in Columbus, Ohio. It has spread all around the globe with more than 400 chapters worldwide. Just Walk is a non-profit organization dedicated to encouraging healthy physical activities for people of all ages and fitness levels. For more information about Just Walk, click here. PCMS is looking for event leaders for the upcoming Walk with a Doc events. This is an excellent opportunity for our members to reach out to our community in a very informal setting. Physicians are asked to make a short presentation on his area of expertise or interest. 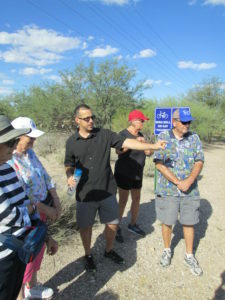 Walkers hike along an easy 2.4 mile path and continue the conversation and ask questions. It is open to all ages and there is no charge. This is also an excellent way to encourage your patients, family, friends and staff to be active. We will fill the spots on a first-come, first-scheduled basis. You don’t have to lead an event to join us. If you are interested in leading a walk, e-mail Dennis Carey or call him at (520) 795-7985.